Last year, I shared an evolution over the years of our living room and then a few weeks ago, I found some old (low quality–sorry!) photos of our home before we bought it and I have been having so much fun walking down memory lane. You know how everyone is sharing the How Aging has Affected You challenge. Well, consider this the house version. This year it will be 6 years of living in our home and like people, I believe homes are supposed to evolve and change. Maybe a room has a really good year, straight-up bad year or some awkward years in there. Our reading room has had all of the above. 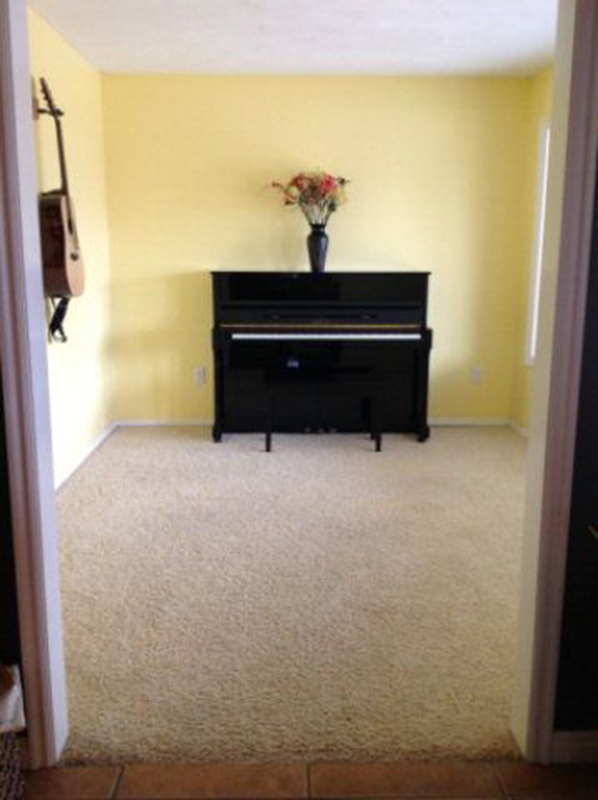 Here’s the listing photo I found of the space before we bought it. When we looked at the home it had been empty for a few months so I didn’t get the chance too see any furnishings anywhere. But I do remember seeing this room and thinking–Well, that’s where the Christmas tree goes. 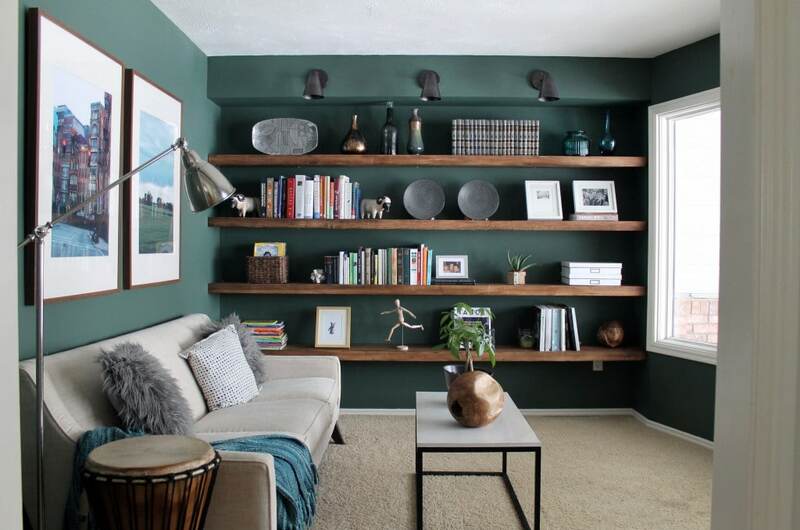 • This room had/has zero lighting–overhead, accent or otherwise so we spent some time building a header and adding sconces and building wall to wall shelves. Even though this was the first version of those shelves (Dec 2013), they’ve stuck around and I still love them. • In the Spring of 2014, right before Faye was born, we tore up all the flooring and laid faux wood tile throughout the entire main level. It must have been around this time that we also inherited Chris’s great grandmother’s piano and it once again became a piano room. Ha! 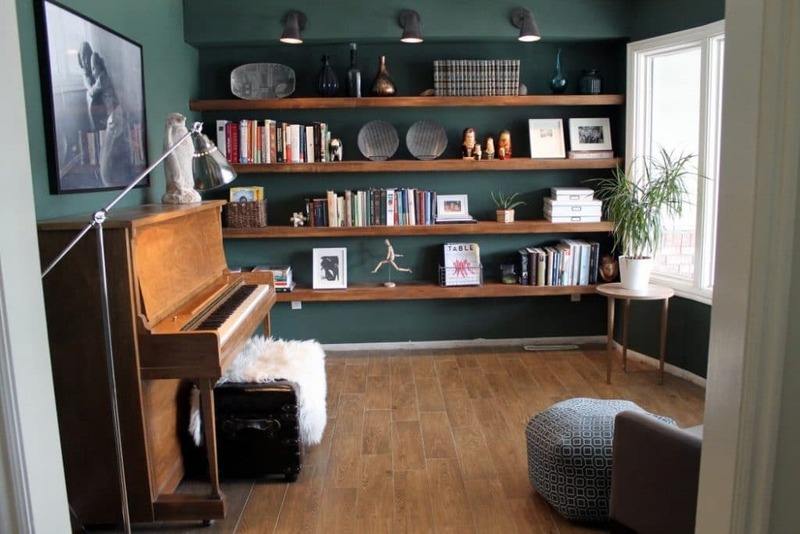 Truthfully this is probably my least favorite version of this room because the tone of the green mixed with a lot of medium wood tones feels pretty 80s to me. • Fortunately, by 2015 (I had a BABY in 2014, so progression slowed way down. I think I remember those baseboards taking months to replace! ), I had figured out that the green needed to go a little darker. We brought back in the former couch and things were looking a little better…but awfully busy looking back. • Then we got a dark black leather sofa, I swapped out the art and I feel like I started finding my groove. I like moody spaces and it was definitely headed in that direction. This was a good year! • Then, to be honest, I feel like we kind of regressed. We had to ditch the acrylic coffee table because of tiny handprints all over it all the time. But adding more seating in here really made the small room feel crowded. 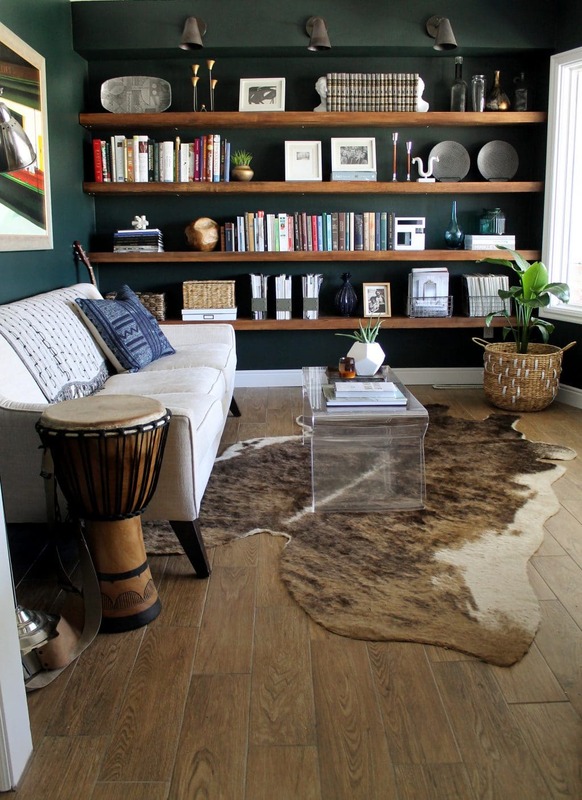 Especially when mixed with a rug that commands a little more attention. It took me until after Christmas that year, after I took the tree out to realize I wasn’t bringing that extra seating back in. • Which brings us to how it looks today! 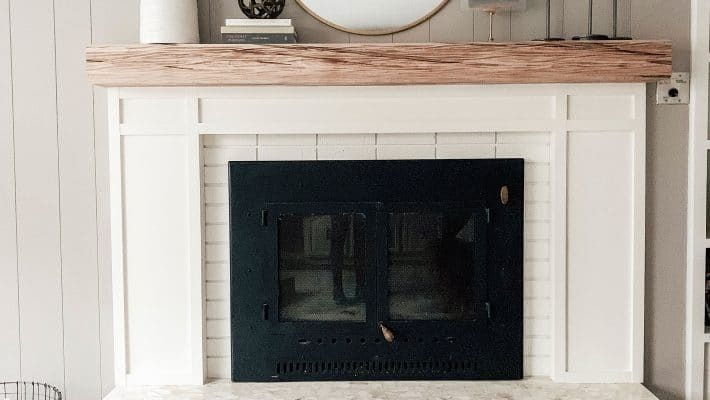 I shopped our house and moved things around and simplified the decor over the years. 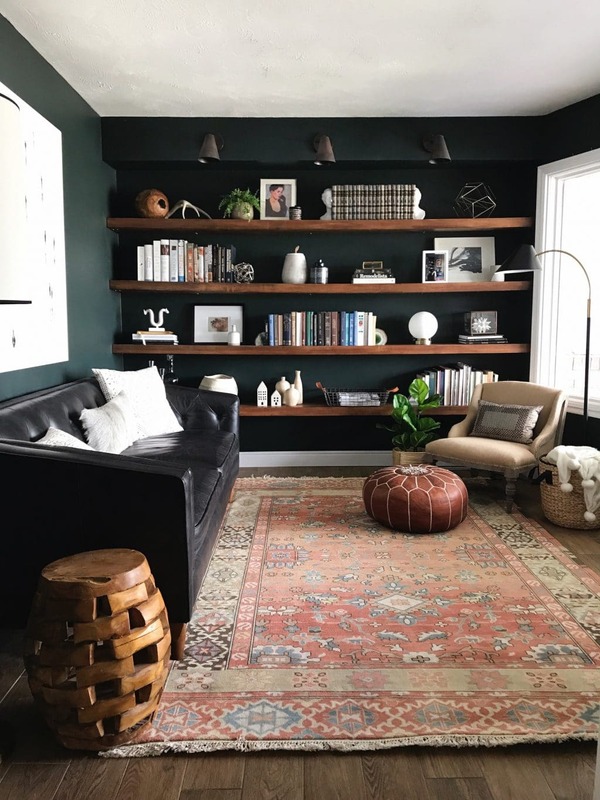 I’ve learned to stick with more neutrals when decorating especially since the wall color and rug complement each other so well–everything else should be supporting. This is one of the first rooms you see when you walk in our home and it’s a room we love to go in and relax when we need a time out. I have a small desk in the corner (see it here) that I sometimes work from and I can look out the front window and see when packages arrive or when Greta gets home from school. 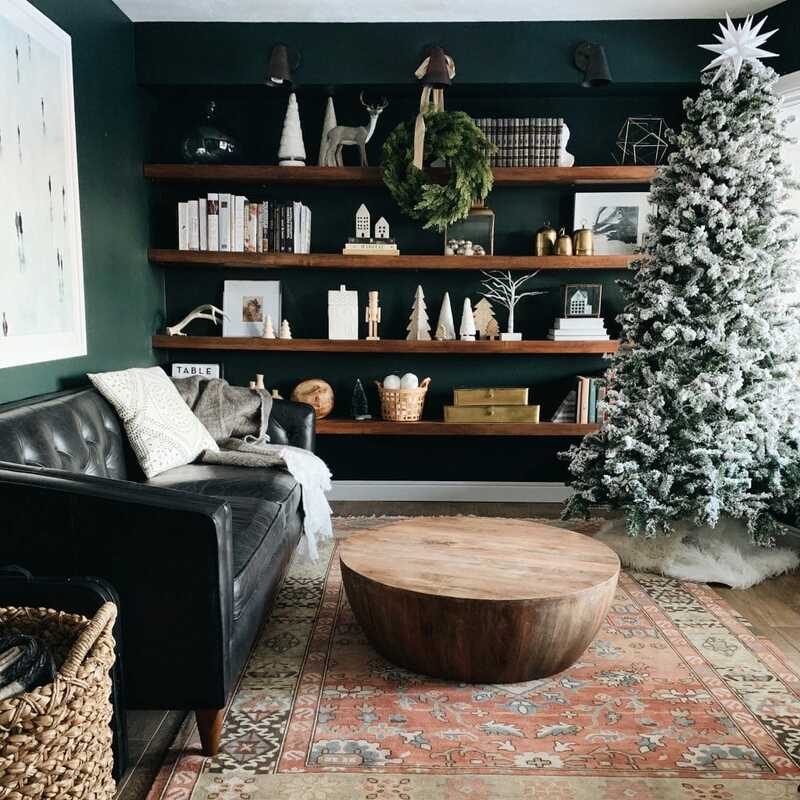 And yes, it’s definitely the perfect room for a Christmas tree. Here’s one more before and after from the day we moved in 2013 to last week (2019). We’ve come a long way baby. Before & After: We have a (Finished!) 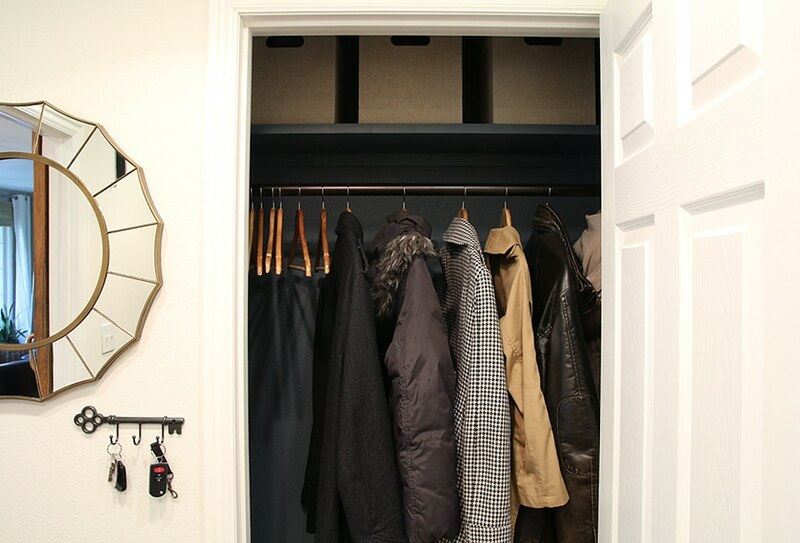 Coat Closet! 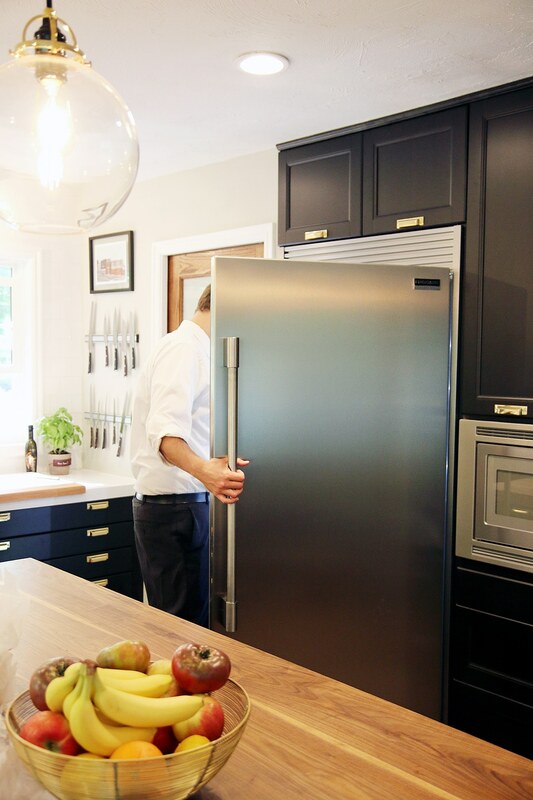 HOW OUR FRIGIDAIRE PROFESSIONAL APPLIANCES TRANSFORMED OUR KITCHEN AND HOW WE USE IT + A VIDEO! What a thrilling room arrangement. Good to see a successful transformation. Love this room! 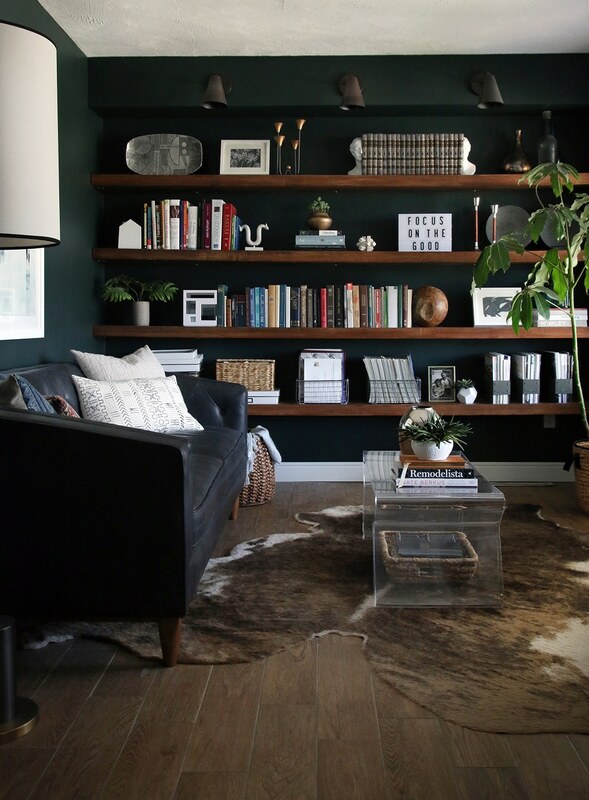 We are trying to build custom shelves very similar- do you have a link for how you built? I love seeing room progressions and how even our own styles change over time! This room is so cozy and I would definitely curl up in here. I love seeing transformations over time. We sometimes think, “What were we thinking?” With the exception of the earliest yours all look like you were thinking pretty clearly but must admit 2019 is the best! Love the Christmas photo! Such a fun post! Love seeing the evolution. Wow, what an amazing transformation! 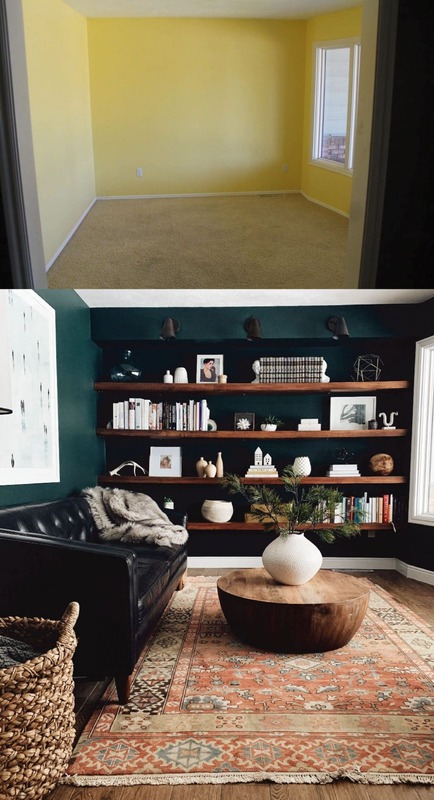 I’m trying to decide what to do with our office/game room by the entryway in terms of paint and decor, and am totally inspired by this room! 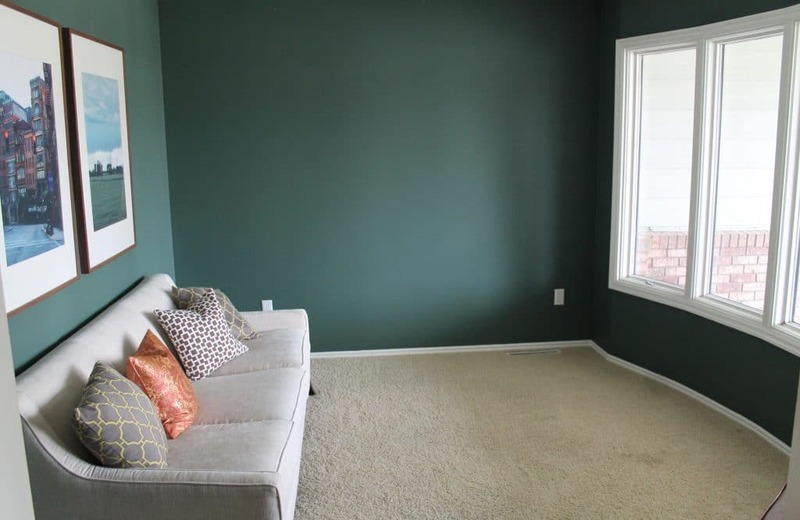 Did you widen that doorway or is the darker paint color making the room look more open and wide? Didn’t change the structure of the room at all! Fun post to read! Makes me wish I’d photographed all our living room iterations before we moved. It was a long awkward room with a fireplace in the middle of the long wall and the front door led directly into it. In our downsize condo, we have an even longer living room but it’s easier to arrange. Still, I’m thinking of moving one of the sofas… and all the bookshelves need tweaking. It can always be better, or at least. fresher! This progression post is just what I needed to read. Making furniture choices feels like such a commitment, but things can always be tweaked and fine tuned. Oh man. When you first switched out the light sofa for the black leather sofa, I remember thinking that it was a mistake. But now, seeing all these photos, it was so OBVIOUSLY the right choice and I am so sorry I ever doubted you! That was so great!!! I often decorate a room, live with it a bit then shop my house and do something different. My husband goes bananas thinking I’m indecisive !! But you have just made me feel 1000x better. You are so right. Every room needs to go thru growing pains till it has the best fit! Thanks so much. 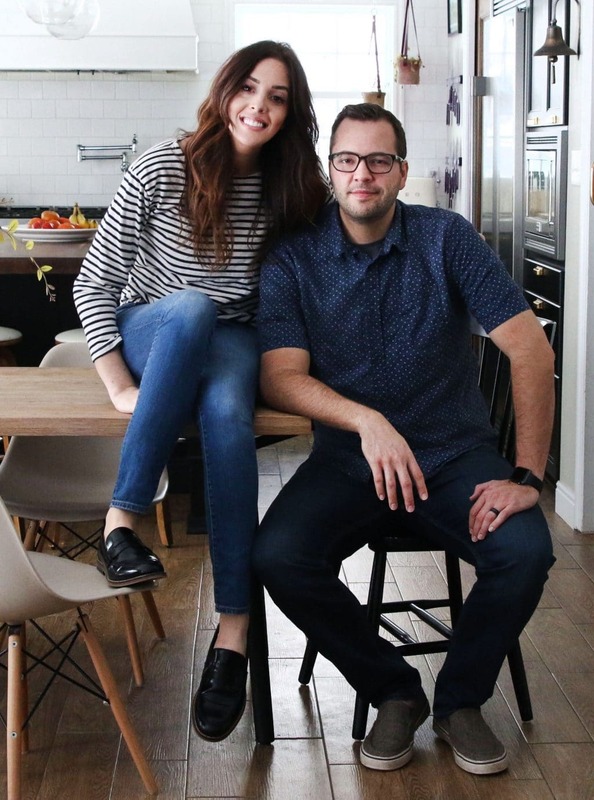 I just now wondered to myself if the people you bought the house from follow along your blog? It would be so interesting to see how they react to the house now since it has changed so much! 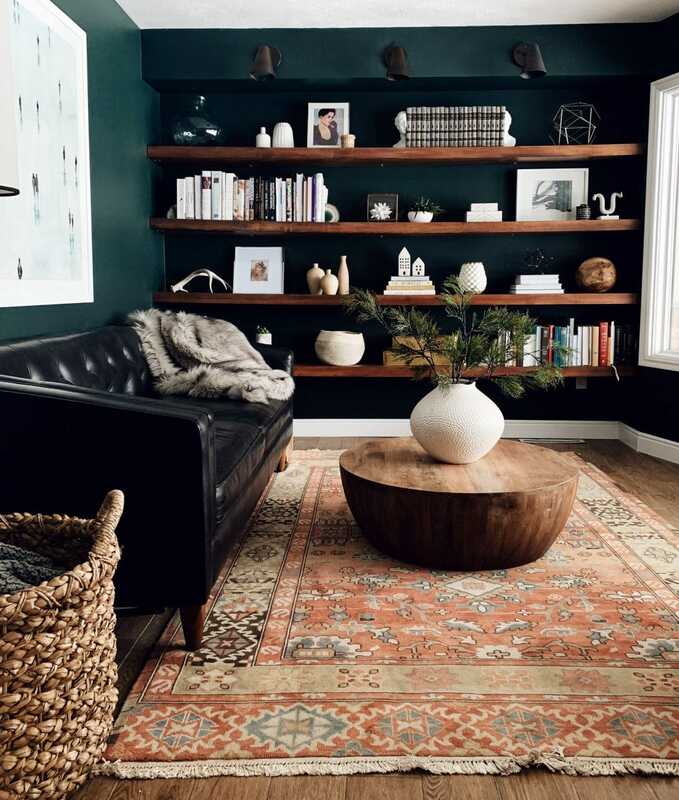 I’m pretty sure your swap to the darker green inspired dark green rooms everywhere! (Including ours!) I love a good room evolution.